In this graphic you can see the Android version market share distribution among smartphone owners in September 2018. This month, Android version 8.0 (Oreo) had a market share of 13.4 percent among smartphone owners featuring Google's Android operating system. 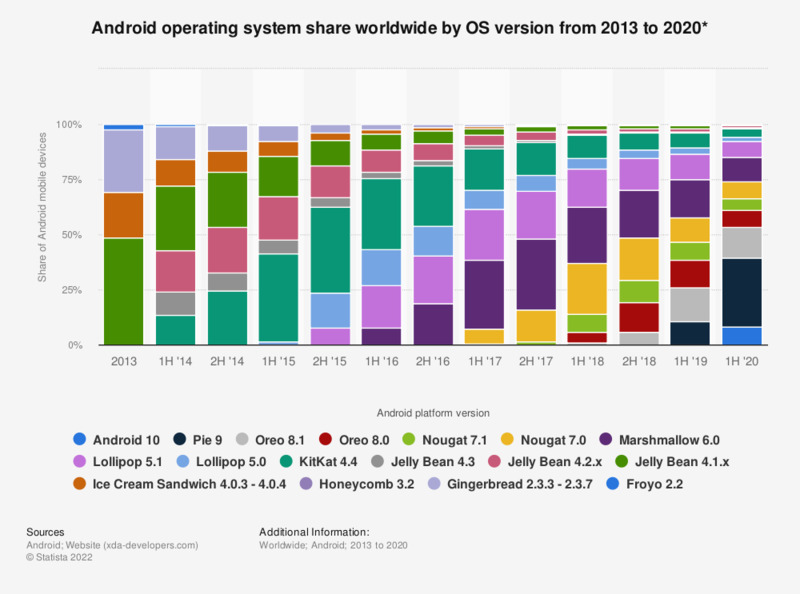 Since the first quarter of 2011, Google’s mobile operating system, Android, has steadily increased its share of the global smartphone OS market. As of the second quarter of 2017, Android leads the global market with an 87.9 percent market share, while Apple’s iOS is second. Android is also the most often used operating system for tablet computers worldwide, with a 66 percent share of the global market in 2016. One of the reasons for the success of Google’s OS is the constant improvement of its many versions, with every new one offering more advanced features, faster access to the internet or increasingly better video and audio. The first commercial version, named simply Android 1.0, was released in September 2008, followed by the Android 1.1 update, released in February 2009. In April of the same year, Google launched the confectionery-themed collection, where every new version of its mobile operating system is named after a dessert. The first of these new versions was called Cupcake and displayed many new features, such as the ability to copy and paste text in web browsers and the ability to upload videos to video-sharing website YouTube. The following Android versions released by Google in alphabetical order were called Donut (September 2009), Éclair (October 2009), Froyo (May 2010), Gingerbread (December 2010), Honeycomb (February 2011), Ice Cream Sandwich (October 2011), Jelly Bean (June 2012), KitKat (September 2013) and Lollipop (June 2014). Another reason for the Android’s popularity is its strong collaboration with mobile device manufacturers, while its main global competitor, Apple’s iOS, is limited to operating only on Apple devices, such as the iPhone, iPad or Apple Watch. As of 2016, an estimated 85 percent of new smartphones were Android-operated devices.